Unique 2-year healthcare marketing cause campaign combining the healing effects of song, dance, music and the arts – to highlight and support RWJ University Hospital Hamilton (RWJBarnabas Health) Cancer Services program. Develop a distinctive and compelling strategic and creative approach that reinforces the specialness of this initiative – celebrating cancer patients, survivors, family members, friends and corporate partners of the hospital. Telling the story and creating the look and feel for Project WE vs C, a collaborative initiative that marries edgy and provocative with hope, healing and transformation. Highlighting inspiring Personal Stories of Triumph ballet performances – celebrating the unique and empowering stories of breast cancer survivors. 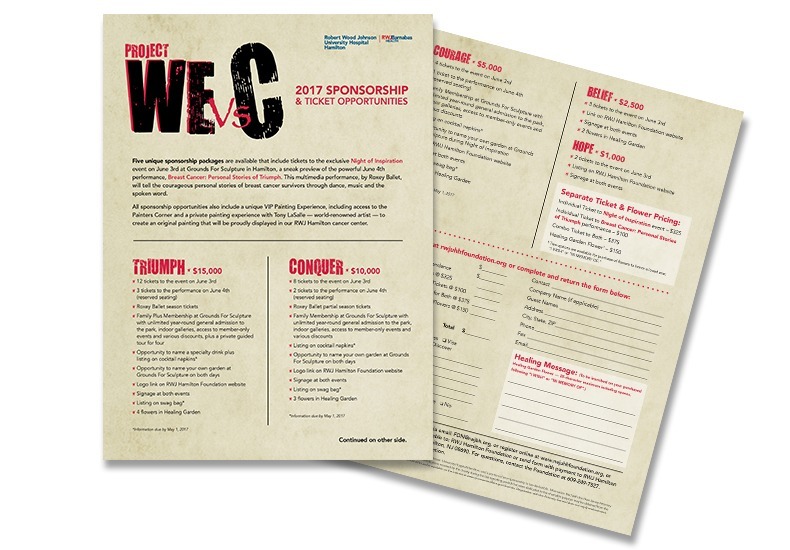 Outlining our named sponsorship opportunities, with fundraising efforts contributing to an $8.5 million, two-year project geared exclusively for enhancements to RWJ Hamilton’s comprehensive cancer program. Measured through funds raised to save more lives through prevention, detection, treatment and ongoing support. Note: Program won a top GOLD award in the category of Foundation/Fundraising from national industry-leading healthcare marketing awards competition Aster Awards.